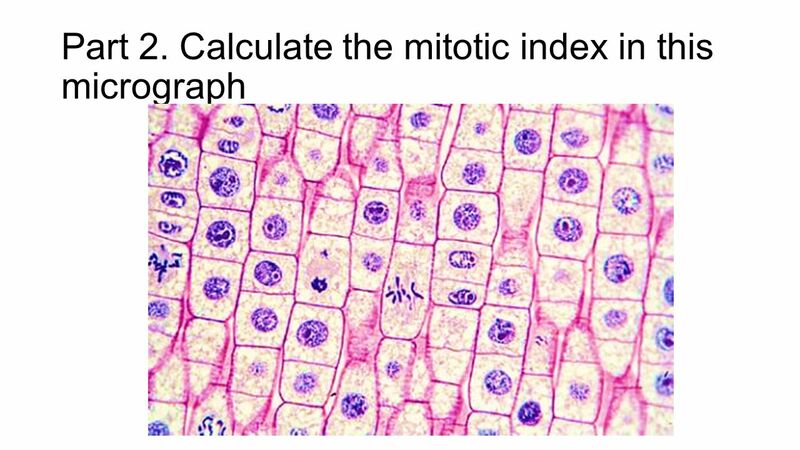 Lesson objectives: What is mitosis, what are the different stages, how to calculate mitotic index. Is there a link with cancer? Cell division: when cells divide to form new cells. Mitosis, Meiosis, and Binary fission are forms of cell division. Sister chromatid: a word used to describe two identical strands of coiled DNA joined together by a centromere (i.e. a chromosome). Tumour: an abnormal growth in the body, resulting from cells carrying out mitosis in an uncontrolled way (may be benign or malignant. Malignant means cancerous). Cyclins: proteins which are released to trigger each stage of mitosis eg. there is a cyclin for prophase, which peaks during prophase. Oncogene: genes which control cyclins. 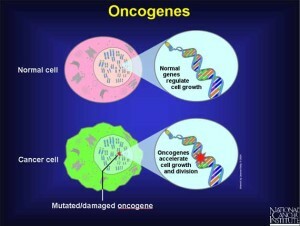 Mutations to oncogenes, are thought to cause cancer. Centrioles, Centrosome, and Microtubule Organizing centres: these are all related terms to the part of a cell that generates microtubules. 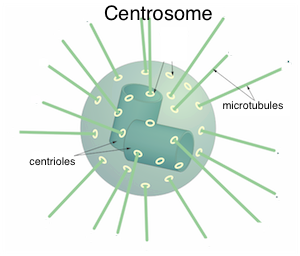 Centrioles: An additional structure in a centrosome, that is only found in animal cells. Consists of two bundles of microtubules, each made from 9 pairs of microtubules, arranged at right angles to each other. Essential questions: Why do cells need to divide. Why can’t we keep the same number of cells, and just let each cell grow bigger? Mitosis is a kind of cell division, which occurs in eukaryotic cells. Cells divide to form two somatic cells, with a diploid chromosome number. Mitosis is associated with growth, repair of cells, and asexual reproduction. Mitosis in action: If you scratch the surface of your skin, the cells of the malpighian layer will be replaced by new cells formed by mitosis. The basement layer is making new cells approximately every 24 hours. The fastest human tissue is a recently fertilised human embryo, (1-8 cell stage), which can go through a mitotic cycle in only 30 minutes!! (this misses out G1, and G2 of interphase, so the cells are minute). Cells in the liver divide only once a year (so take care of your liver, it is slow to recover eg. from alcohol poisoning). Q) When was the DNA duplicated to form the sister chromatids? Q) What else needs to be duplicated? 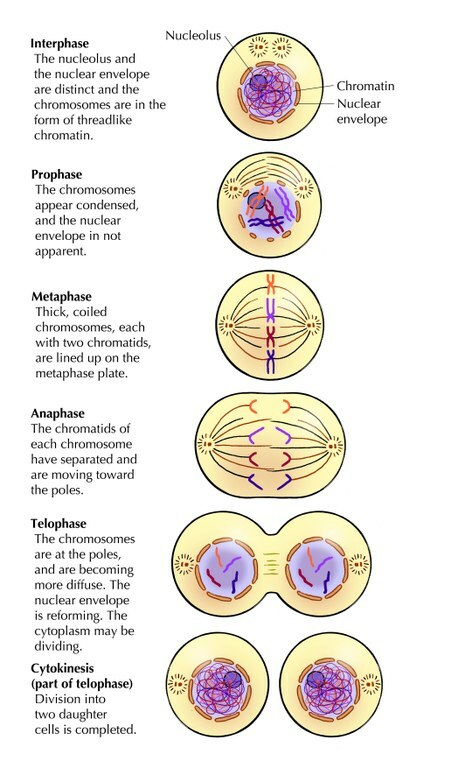 Interphase is the stage in between mitosis. Interphase, Mitosis and Cytokinesis complete the cell cycle ) below. 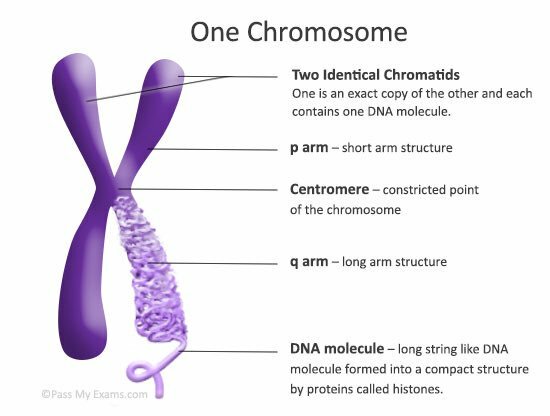 The DNA occurs as chromatin, and not in chromosomes. Interphase was once wrongfully thought of as a ‘resting stage’. It is now recognised as being highly metabolically active. G2: Expansion of the cell and more replication of non-DNA materials. This mathematical formula represents the ratio of cells during mitosis, to the total number of cells. This is useful in that the mitotic index is a function of how fast cells are dividing. Cells with a high mitotic index are dividing more frequently, and are therefore growing faster. This could be bad news in a malignant tumour. Cyclins are proteins which control the stages of the cell cycle. There are four main types of cyclins in human cells, and they activate each other with the help of enzymes to perform their tasks in succession, like a relay team. In this way, mitosis can be controlled and cells only divide when they are needed. Sir Tim Hunt discovered the cyclins in 2001 quite by accident alone in his lab in London. Watch this interview to listen to his story. -what was Sir Tim trying to find out in his experiment? -what anomaly did he notice in his data? -do serendipity and accidents have a place in science? -what attitude should we take to strange results that we find in our own experiments? Mitosis is usually regulated by the body, and new cells are only produced when needed. We know that this is due to the effect of cyclins, and also due to special genes called oncogenes which help regulate cell division. Mutations are changes in DNA. These are caused by mutagens (DNA -changing agents, also called carcinogens). 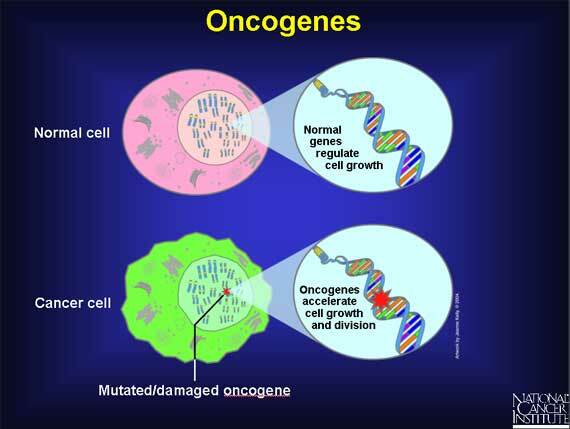 If the mutagen causes a mutation in an oncogene, then they can cause a cell to begin dividing irregularly, as oncogenes will not do their job properly. This can lead to the formation of a tumour. A tumour is a group of abnormal cells that develop due to abnormal cell division. Benign tumours stay in one place in the body, and these do not cause cancer – they may be removed through surgery. Sometimes the tumour may be classified as malignant. Cancer is the presence of malignant tumours in the body. Malignant tumours spread abnormal groups of cells around the body and may set up secondary tumours. The mechanism for this is called metastasis. The mechanism behind metastasis is explained in this video, although you are not required to know about the role of chemicals (eg. MMP), in the process.